Please identify which policies, if any, from Cambridge’s Growth Policy Document should be changed. Existing residential neighborhoods, or any portions of a neighborhood having an identifiable and consistent built character, should be maintained at their prevailing pattern of development and building density and scale. Except in evolving industrial areas, the city’s existing land use structure and the area of residential and commercial neighborhoods should remain essentially as they have developed historically. The wide diversity of development patterns, uses, scales, and densities present within the city’s many residential and commercial districts should be retained and strengthened. That diversity should be between and among the various districts, not necessarily within each individual one. Adequate transitions and buffers between differing scales of development and differing uses should be provided; general provisions for screening, landscaping and setbacks should be imposed while in especially complex circumstances special transition provisions should be developed. The major institutions, principally Lesley College, Harvard University, Massachusetts Institute of Technology and the hospitals, should be limited to those areas that historically have been occupied by such uses and to abutting areas that are reasonably suited to institutional expansion, as indicated by any institutional overlay district formally adopted by the City. For such institutions reasonable densities should be permitted in their core campuses to forestall unnecessary expansion into both commercial districts and low density residential neighborhoods. 4. The presence of a stable, well managed institutional activity could encourage, stimulate, and attract increased investment in non-institutional commercial tax producing development. The availability of transit services should be a major determinant of the scale of development and the mix of uses encouraged and permitted in the predominantly non-residential districts of the city: the highest density commercial uses are best located where transit service is most extensive (rapid transit and trolley); much reduced commercial densities and an increased proportion of housing use are appropriate where dependence on the automobile is greatest; mixed uses, including retail activities in industrial and office districts, should be considered to reduce the need to use the automobile during working hours. Similarly, the scale, frequency, mode and character of goods delivery should play an important role in determining the appropriate density of non-residential uses anywhere in the city. 4. Uses incompatible with the city’s existing and future desired development pattern are phased out. 4. To limit the secondary impacts of new development on the existing, established neighborhoods. These impacts may be both economic, as in the increased demand placed on the limited stock of existing housing, and environmental, as in the increase in traffic on neighborhood streets. A wide range of development patterns should be encouraged in these evolving industrial areas at scales and densities and in forms which would be difficult to accommodate in the city’s fully developed districts and neighborhoods. Those necessary or desirable uses and activities which require specially tailored environments should be provided for and those uses, activities and development patterns which create distinctive environments that serve as amenities for the whole community should be protected or maintained. For example: low rent industrial space for start up enterprises; locations for industrial use and development which could be compromised by proximity to other, incompatible, uses, including residential uses; small commercial enclaves which directly serve their immediate surrounding residential neighborhood; locations appropriate for gas stations, car repair facilities, tow yards, etc. ; structures or clusters of structures eligible for local historic district designation; or for designation as a local conservation district; environments as frequently found in the Residence “A” districts, where a unique combination of distinctive architecture and landscaped open space prevails; areas designated or eligible as national register historic districts. A pace of development or redevelopment should be encouraged that permits the maintenance of a healthy tax base, allows for adjustment and adaptation to changing economic conditions, and is consistent with the City’s urban design and other physical development objectives yet does not unreasonably disrupt the daily activities of the city’s neighborhoods and residents or overburden the city’s water and sewer infrastructure. Increase the City’s investment in Transportation Demand Management to promote non-single occupancy vehicle forms of transportation and assist Cambridge employers, both individually and collectively, in developing such programs for their employees and operations. Enact land use regulations that encourage transit and other forms of non-automobile mobility by mixing land uses, creating a pleasant and safe pedestrian and bicycle environment, and restricting high density development to areas near transit stations. Encourage regional employment patterns that take advantage of areas well served by transit to and from Cambridge. Seek implementation of MBTA transit improvements that will provide more direct and, where demand is justified, express service to Cambridge from those portions of the region now inadequately served by transit to Cambridge. Improve MBTA public transportation service within the city including updating routes, schedules, signs, and bus stop placement. Investigate the feasibility of developing and implementing, within the financial resources of the City, a paratransit system, utilizing taxi cabs where appropriate, in order to supplement the current MBTA system in Cambridge. Encourage the state transportation and environmental agencies to develop a regional goods movement plan; in the meantime, use the City’s limited authority as much as possible to route truck traffic around rather than through residential neighborhoods. Discourage vehicle travel through residential areas both by providing roadway improvements around the neighborhoods’ perimeters and by operational changes to roadways which will impede travel on local streets. Undertake reasonable measures to improve the functioning of the city’s street network, without increasing through capacity, to reduce congestion and noise and facilitate bus and other non-automobile circulation. However, minor arterials with a residential character should be protected whenever possible. Encourage all reasonable forms of non-automobile travel including, for example, making improvements to the city’s infrastructure which would promote bicycling and walking. Support regional transportation and land use policies that will improve air quality by reducing dependence on single occupancy vehicles, both through reduction in employment-based travel and in other trips taken for non-work purposes. Promote the use of truly clean alternative vehicle technologies for necessary vehicle travel particularly in regards to fleets. Maintain and preserve existing residential neighborhoods at their current density, scale, and character. Consider exceptions to this policy when residents have strong reservations about existing character, are supportive of change, and have evaluated potential changes in neighborhood character through a planning process. Where possible, construct new affordable housing that fits neighborhood character. In existing residential neighborhoods housing should be built at a scale, density, and character consistent with existing development patterns. Permit reconstruction of affordable housing (defined as more than 50% of units rented or owned by households at 80% or less than median income) that serves a wide range of incomes and groups at previous nonconforming density where reconstruction is less expensive than rehabilitation. Emphasize construction of affordable housing designed for families with children. Affordable housing in rehabilitated or newly constructed buildings should serve a wide range of households, particularly low and moderate income families, racial minorities, and single persons with special needs. Encourage rehabilitation of the existing housing stock. Concentrate City funds and staff efforts on rehabilitation that will provide units for low and moderate income residents. Concentrate rehabilitation efforts in the city’s predominantly low and moderate income neighborhoods. Promote affordable homeownership opportunities where financially feasible. Encourage non-profit and tenant ownership of the existing housing stock. Encourage where appropriate, recognizing housing’s possible impact on desirable industrial uses, the construction of new affordable housing through requirements, incentives, and zoning regulations, including inclusionary zoning provisions, in portions of the city traditionally developed for non-residential, principally industrial, uses. Create effective, well designed transitional zones between residential and industrial uses. Cambridge’s evolving industrial areas are a valuable resource whose mix of uses must be carefully planned over the next twenty years. Appropriate development in the city’s evolving industrial areas should be encouraged to maintain the city’s overall economic health, to expand the tax base, and expand job opportunities for Cambridge residents. The observable trend towards the development of clusters of related uses in the city’s evolving industrial areas should be strengthened through the city’s land use policies. In evolving industrial areas for which economic development, urban design, or other plans have been developed, private phased development consistent with those plans should be permitted to develop to completion, even if completion may take more than a decade. Within clearly established limits, land use regulations in the evolving industrial areas should recognize the need for flexibility of use as, for instance, between office, research, and light manufacturing activities and provide for a wide range of density options throughout the city including those which foster research and development and start up operations. Development patterns in all non-residential areas must be planned to minimize negative impact on abutting residential neighborhoods. The City should actively assist its residents in developing the skills necessary for them to take full advantage of the city’s changing economic makeup and to provide the personnel resources which would make Cambridge a desirable place to locate and expand. The benefits of a strong employment base should be extended to portions of the resident population that have not benefitted in the past; the City should support appropriate training programs that advance this objective. While recognizing some of the disadvantages of any urban location for many kinds of manufacturing activities, the City should make every effort to retain and recruit a wide range of enterprises suitable for a Cambridge location, presently, or in the future as manufacturing processes evolve and change. Where possible the disadvantages should be minimized and the real advantages strengthened for manufacturing activities that can widen the city’s job base and solidify its economic vitality. The City should establish the regulatory environment and provide the support necessary to encourage the establishment of manufacturing activities for which the city may be a suitable location in the future. The City should actively cultivate a regulatory and policy environment that assists in the retention of existing industries, supports the creation of new businesses and the innovative thinking that precedes it, retains an inventory of low-cost space necessary for fledgling enterprises, and fosters an innovative environment where entrepreneurship thrives. Specialized economic activities for which Cambridge is a congenial host, such as the tourism and hospitality industries, should be supported. The diversity, quality, and vigor of the city’s physical, ethnic, cultural, and educational environment should be nurtured and strengthened as a fundamental source of the city’s economic viability. More specifically, minority businesses and economic entrepreneurship should be encouraged. Existing retail districts should be strengthened; new retail activity should be directed toward the city’s existing retail squares and corridors. Retail districts should be recognized for their unique assets, opportunities, and functions, and those aspects should be encouraged, in part to assure that they can compete with regional shopping centers and maintain their economic viability. The City and its major institutions should engage in a formally established ongoing dialogue to share concerns; identify problems, conflicts, and opportunities; and to fashion solutions and areas of cooperation to their mutual satisfaction. As part of this dialogue, each institution should create a plan describing its existing status as well as outlining its future needs and goals, and the means for achieving those goals. The City should recognize the need for the major institutions to adapt and respond to changing circumstances to maintain their leadership positions in education, health care, and research while recognizing, responding to and coordinating with City policy goals. Where tax-exempt academic uses are expanded into retail corridors and squares, mixed-use development including taxable retail or other commercial development should be incorporated wherever possible, especially at street level, recognizing each retail area for its unique assets, opportunities and functions, and strengthening these aspects when expanding into such areas. The city’s major educational institutions should be encouraged to provide housing for their respective faculties, students, and staff through additions to the city’s inventory of housing units. Effective use of existing land holdings should be a tool in meeting this objective, where it does not result in excessive density in the core campus. In addition, where new housing is to be located within or abutting an existing neighborhood, it should match the scale, density, and character of the neighborhood. The institutions should be encouraged to retain this housing for client populations over an extended period of time. They should consider housing other city residents within these housing developments as a means of integrating the institutional community with city residents. Except in circumstances where further institutional growth is appropriate or beneficial to the city as a whole (see Policy 7) the city’s institutions should be discouraged from creating new fiscal burdens on the City treasury through the conversion of property from tax-producing uses to non-taxable uses, and should mitigate any harmful effects of such conversions through financial compensation. The institutions’ capacity for commercial investment should be directed in part to assist in the transformation of evolving industrial areas and commercial districts, as defined by City policy and elaborated upon through formally established, ongoing planning discussions. Where major institutions invest in commercial properties, their willingness to manage those properties partly in response to broader community objectives of diversity and community need, as articulated through the continuing formal dialogue with the City and its residents, should be encouraged, consistent with the institutions’ fiduciary responsibilities. Recognizing the localized nature of their physical presence, the city’s smaller institutions should be regulated on an individual basis as provided in the zoning ordinance’s institutional regulations and as they are impacted by zoning, urban design, and other City policies. Design review for new development should be established throughout the city for all areas where future development will be of a scale or quantity that will potentially change or establish the character of the district. Even in areas where the character of a district is firmly established and new development is likely to be very modest, design review should be required where small scale changes are likely to disrupt the desired district character. The regulations for all zoning districts in Cambridge should reflect the city’s fundamental urban design and environmental objectives: height, setback, use, site development, and density standards imposed should be consistent with or advance those urban design objectives. Urban design and environmental standards should be developed for all areas of the city which are or may be in the future subject to redevelopment or significant new development. Urban design standards should reflect the historic context within which change will occur while permitting design that is responsive to contemporary circumstances. As transitions between differing uses are extremely important in a densely developed city, urban design standards should be developed to ensure that these transitions are made properly, respecting to the maximum extent possible the needs of each contrasting use. Open space and recreational facilities serving a wide range of functions and clientele, including the elderly and special needs populations, should be encouraged, either through expansion of the existing inventory, through multiple use of existing facilities, or through creative programming of those facilities. Conservation lands and other environmentally sensitive areas are a vital part of the city’s open space system and should be maintained and protected appropriately. Public access to and use of these areas must be carefully planned and balanced with preservation of these resources. Expansion of Cambridge residents’ opportunities to use regional recreational facilities (those owned by the Metropolitan District Commission and the Commonwealth) located in the city should be encouraged, particularly where the adjacent residential community is underserved by local recreational facilities, and when the legitimate regional use of that facility would not be unduly restricted. In addition, there should be increased coordination of recreation programming and planning between the local and regional levels. New open space facilities, including larger ones for organized activities, should be considered for those private developments where the size of the development, the amount of land area and/or the ownership patterns provide the flexibility to accommodate such a facility without loss of economic value for other uses. Acquisition of publicly owned or administered open space should be made in those dense residential areas clearly deficient in all forms of open space, but only where significant fiscal resources are provided through federal or state acquisition programs or a substantial portion of the cost is borne privately; facilities of modest size and flexible in use characteristics, located close to the homes of the persons for whom they are intended should be encouraged. Only under extraordinary circumstances should existing open space facilities be eliminated from the city’s inventory for other uses; small, passively or merely visually used facilities, should not be undervalued in this regard merely for lack of intensive or active recreational use. The city should encourage the permanent retention and protection of useful, effective, attractive private open space whether publicly accessible or not. Community use of private recreational and open space facilities in the city should be encouraged at reasonable levels where the private function of those facilities would not be impaired and where the recreational activity provided by the private facility is not well served in available public facilities. Repair, maintenance and timely upgrading of existing facilities should be the City’s highest fiscal priority with regard to open space and recreational facilities. The City should explore, and adopt as appropriate, mechanisms whereby the private sector can reasonably provide, assist in and/or contribute to the maintenance of publicly useable open space and recreational facilities. A Better Cambridge (ABC), Cambridge’s citywide group of residents working to build a more diverse and livable Cambridge, has announced a fall discussion series to help engage Cambridge residents, political candidates, and policy experts in planning for the growth of a sustainable Cambridge that provides affordable housing options for all families. As Cambridge embarks on a citywide plan for development our real estate market booms and our population is expected to grow in the coming decade, low and middle-income families in Cambridge city still struggle with unaffordable and rising housing costs. How can we ensure that new development in Cambridge serves the housing needs of all families including those with lower incomes? How does this relate to other important development issues – density, walking/biking/public transit, parking, and creating exciting, walkable neighborhoods? A Better Cambridge brings together experts to discuss what Cambridge can do to build a more diverse, affordable, and livable city for all families. This panel will be held on Saturday, 9/26, 3:00pm to 5:00pm at the Citywide Senior Center (806 Mass. Ave, Central Square). For updated information, including the announcement of additional panelists and moderator, visit the ABC website: http://www.abettercambridge.org/housing_forum_2015. Cambridge stands at a crossroads and the next City Council will play a major role in determining the future diversity, sustainability, and character of our city. As we look to this November’s municipal election, residents want to understand how all City Council candidates approach the development challenges and opportunities facing our city. Join candidates for Cambridge Cambridge City Council in a moderated discussion about their plans and visions for our city’s future. This candidates forum will be held on Thursday, October 15th, 6:30pm to 9:30pm at the Broad Institute (415 Main Street, Kendall Square). The moderator will be Robin Young, host of "Here and Now" on WBUR. Please stay tuned to the ABC website for more details. ABC is Cambridge’s only citywide pro-smart growth resident group. 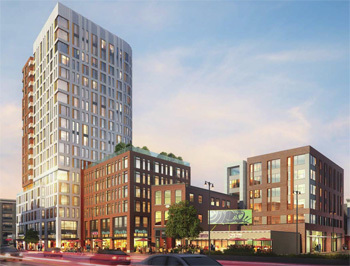 Since our founding in 2012, ABC has been instrumental in opposing the downzoning of Central Square, advocating for expansion of a mixed-use neighborhood in Kendall Square, and most recently, securing the promise of 50 units of affordable housing at Mass. Ave & Main Street. For more information about ABC or either of these events, contact jesse@abettercambridge.org. The other finalists in the City’s selection process were Sasaki, and Perkins + Will. On July 27, 2015, the finalists made presentations to and answered questions from the public in an event held in the Sullivan Chambers in City Hall. Following the public presentations, the City’s Selection Committee conducted a multi-day evaluation process that resulted in City Manager Richard C. Rossi accepting the recommendation to hire Utile. Over the next few weeks the City will be working with Utile to finalize a contract, including financial arrangements, for the public process that will begin this fall. The planning process that will be kicked off this fall will span multiple years and will include a robust community engagement process. The planning process will examine a broad range of issues, including mobility, housing, land use, urban design, environment, social equity, economic development, and open space. Stay tuned for more information in the coming weeks about the public process that will begin this fall! For more information, please visit the project page on the Community Development Department’s website, or email CambridgeConversations@CambridgeMA.gov. Utile is a 40-person, Boston-based planning and design firm. Built like a think tank, the firm thrives on solving complex problems in intelligent and pragmatic ways. From theoretical issues that frame policy to the practical implementation of architectural commissions, Utile develops a rigorous research-based approach for finding the best solutions. Utile specializes in unique regulatory, political, and design challenges, and is committed to the revitalization of the American city through proactive planning and design that bridges public and private jurisdictional boundaries. There are plenty of items from which to choose on this week’s agenda, but there’s really little doubt that the one to watch is the vote to ordain the Normandy/Twining petition that would allow a significant number of new apartments to be built at the eastern end of Central Square, a.k.a. Lafayette Square. Manager’s Agenda #19. Transmitting communication from Richard C. Rossi, City Manager, relative to a Planning Board recommendation on the Normandy/Twining (Mass and Main) Zoning Petition. The Planning Board recommends adoption with suggested modifications. Unfinished Business #2. A communication was received from Donna P. Lopez, City Clerk, transmitting a report from Vice Mayor Dennis A. Benzan and Councillor Dennis J. Carlone, Co-Chairs of the Ordinance Committee, for a public hearing held on Apr 1, 2015 to continue discussions on the Normandy/Twining petition. The question comes on passing to be ordained on or after May 11, 2015. Planning Board Hearing held Feb 24, 2015 and continued on Apr 28, 2015. Petition expires May 27, 2015. Communications – 30 letters in support of Normandy/Twining Petition and 21 letters opposing Normandy/Twining Petition. The necessary votes appear to be there to ordain this petition, but the real story is the political dynamics surrounding it. 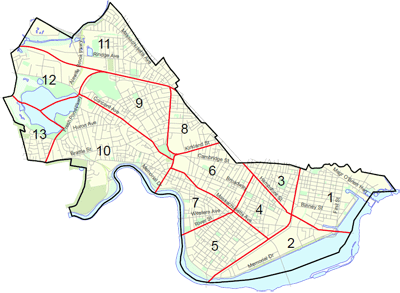 The Cambridge Residents Alliance (CResA), an unregistered political action committee disguised as a non-profit civic association, was born a few years back in response to the very things this petition would bring, i.e. additional height and residential density in Central Square. Back then it was the prospect of apartment buildings popping up on Prospect Street and Bishop Allen Drive and a residential tower behind the firehouse in Lafayette Square. Those ideas were either withdrawn or put on permanent hold. Other ideas were floated during the C2 process that helped to shape their recommendations, but the prospect of something actually being built only began to materialize at the end of the C2 process when the Quest properties in and around Lafayette Square were sold. There was little doubt that something would be done with these properties. Objectively speaking, there’s a lot to be said for bringing significant new housing to this location, especially with a sizable number of units set aside for people with low/moderate income. There’s also some great possibilities in terms of ground floor retail and what people these days like to call "placemaking". It’s also very significant that a residential building is being proposed rather than an office or lab building. On the other hand, this is also an opportunity for politics and we’ve seen a lot of that lately. There was an organized effort to turn an Ordinance Committee meeting on this petition into a tribunal directed at any city councillor who ever took a dollar from a property owner or developer. Poorly researched investigations into other Normandy-owned properties led to slanderous accusations propagated on various listservs. CResA activists and their scribes promoted conspiracy theories about City departments trying to work around the Zoning Ordinance and evade planning. A well-considered (and courageous) letter sent out by Councillor Kelley over the weekend has sparked some angry responses from the perpetually closed-minded. Through it all we’ve seen incumbent city councillors slandered while new candidates bulk up their campaign accounts and try to recruit feeder candidates for the November election – all of this over the building of new homes (near transit) where people can live. It’s worth noting that a significant amount of public testimony on this matter has been in support of the Normandy/Twining petition, and many people who are not taking sides on the issue at least generally acknowledge that if there is to be residential density in Cambridge this is a pretty sensible place for it to be located. Manager’s Agenda #20. Transmitting communication from Richard C. Rossi, City Manager, relative to a Planning Board recommendation on the Chestnut Hill Realty Zoning Petition. The Planning Board recommends adoption. This appears to be just a technical improvement of a zoning change enacted a couple of years ago. This is a matter that has lots of people pretty charged up. I teach mathematics primarily to university students, but I also have quite a few high school students in my Harvard Extension School classes. You’ll never hear me arguing against the need for better standards in mathematics education – especially when it comes to challenging students to aim higher. Part of that means having some standardized testing and I don’t especially care what form that testing takes as long as it’s fair. I also have never been of the "every kid gets a trophy" mindset, but I do think it’s important that every kid have a path to graduation even if it means adjusting the path. Not all kids are destined to win Nobel Prizes, but everyone deserves a chance to one day have a chance at economic opportunity – especially in a city like Cambridge. Minimal standards won’t help to achieve that goal. Is PARCC better than MCAS? I don’t know, but I sure wish people would just make a good decision and go with it. Committee Report #3. A communication was received from Paula Crane, Deputy City Clerk, transmitting a report from Councillor E. Denise Simmons, Chair of the Housing Committee for a public hearing held on Apr 30, 2015 to continue the Apr 22, 2015 discussion on the incentive zoning study from the Community Development Department. While the political people have been obsessing over Normandy/Twining, housing in the Alewife area, and the ultimate legal resolution of the Sullivan Courthouse, there has been an ongoing review and update to some of the financial mechanisms that help to fund various affordable housing initiatives via fees derived from new non-residential development. The recommendations contained in this Order are mostly timely and appropriate, but I’m skeptical about any effort to tie linkage fees to job training programs or the City’s living wage ordinance for reasons similar to why unionized labor requirements should not be written into the Zoning Ordinance. Not all good standards and practices should be bound into law. Some things, like lease covenants requiring tenants to not seek residential parking permits, are best left as agreements and understandings rather than governmental requirements. Ideally, once the Normandy/Twining zoning petition is settled, there should be renewed interest and greater seriousness about the C2 study and its recommendations. Sometimes it takes a serious development proposal to motivate people to actually get serious. This isn’t the only example of that principle in action. Committee Report #1. A communication was received from Donna P. Lopez, City Clerk, transmitting a report from Councillor Dennis J. Carlone, Chair of the Transportation and Public Utilities Committee for a public hearing held on Mar 25, 2015 to receive updates and to discuss next steps for the shared-use, rails-with-trail path along the City’s Grand Junction Corridor. Plowing, or sweeping under the rug? 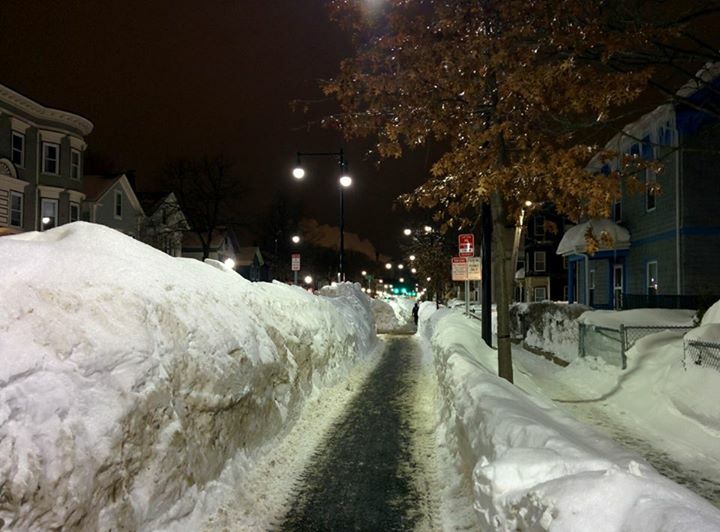 The photo of the Western Avenue bikeway with this post has been making the rounds in bicycling advocacy circules, accompanied with praise for Cambridge’s plowing it. You can praise the plowing all you like, but in terms of safety, it amounts to window dressing, distracting from problems which would not exist except for the segregated bikeway: with the snowbanks, bicyclists and motorists are both going to have to come nearly to a complete stop at every crossing to see each other in time to avoid collisions. Streets, on the other hand, even narrowed by snow, are wide enough that the cyclists can ride away from the edge, and motorists can poke out far enough to see approaching traffic without the risk of collisions. The bikeway is also too narrow for one bicyclist safely to overtake another. The street is wide enough for anyone — bicyclist or motorist — to overtake a bicyclist, though maybe not always wide enough for one motorist to overtake another, what with the snow. It is narrower too because of the space that was taken out of it for the bikeway. The street also most likely is clear down to pavement within a day or two after a snowfall, and it is crowned so meltwater drains to the curbs. The bikeway is going to be a sheet of ice if there are thaw/freeze cycles, unless there is a very heavy application of road salt. Bicycling is already difficult enough in winter without the added difficulties and hazards imposed by this bikeway. Comments Off on Plowing, or sweeping under the rug? It seems that the fate of plastic bags in the City of Cambridge is suspended in limbo. Multiple iterations of a Plastic Bag Reduction Ordinance have been ferried in and out of City Council hearings since 2007, but without a resounding “Aye!” After successive rounds of discussion and drafting, then-councilor Marjorie Decker introduced her “Plastic Bag Reduction Ordinance” in July 2013. This required retail establishments to distribute either recyclable paper bags or reusable checkout bags to customers. The law was never called to vote because of Decker’s departure to the state legislature, and the arrival of four newly elected councilors. So Decker’s ordinance went back on the revision merry-go-round, resulting in an amended version of the 2013 bill titled the “Checkout Bag Ordinance of the City of Cambridge”. The revised amendment package, proposed on October 27, was placed before the council in December 2014. However, a scattered consensus and interpolation of additional amendments has resulted in the postponement of a vote to February 2015. In its conception, the plastic bag bill functions to counteract the “single use, throwaway” culture of city life, which contributes to global climate change, and degradation of the natural environment through littering and waste production. Both versions of the ordinance promote the distribution of recyclable or reusable bags by retail establishments in Cambridge. So, why does the plastic bag issue keep getting recycled in hearings? One reason is the discordant opinions on the severity of the bill. Decker’s original version was undoubtedly more stringent in its enforcement. It defined “recyclable paper bag” as a 100% recyclable bag that contains at least 40% post-consumer recycled content; the amended version simply defined it as a 100% recyclable bag, and also permitted the usage of compostable plastic bags. The revised Checkout Bag Ordinance also permits the city’s Public Works Commissioner exemption powers under circumstances of “undue hardship” to retailers, for up to 2 years. In contrast, Decker’s 2013 ordinance only granted 6 month exemptions. Given that the plastic bag restrictions are broadly imposed upon retail establishments, including restaurants, pharmacies and grocery stores, thus extending the regulatory reach of the bill, dissent on the bill’s severity is unsurprising. Additionally, new amendments continue to facilitate debate, and by extension, indecision! New addenda proposed in the December 2014 hearing include an amendment to exempt church events from the regulations and to establish an oversight committee for businesses to directly appeal restrictions. The newer Checkout Bag Ordinance is more balanced, and more likely to appeal to the greater Cambridge community. More importantly, tweaks and revisions can be identified in a more targeted and effective manner once the ordinance has been passed by the council. The plastic bag ordinance has been tethered in legislative limbo for long enough. Hopefully, it will be brought to reality in 2015. City Manager’s Agenda #1. Transmitting communication from Richard C. Rossi, City Manager, relative to appointments of the following citizens to the Planning Board effective December 1, 2014: Mary T. Flynn, Louis J. Bacci Jr., and Thacher Tiffany (Associate Member), and I have reappointed H. Theodore Cohen, and Catherine Preston Connolly. I am pleased to inform you that I have appointed the following citizens to the Planning Board effective December 1, 2014: Mary T. Flynn, Louis J. Bacci Jr., and Thacher Tiffany (Associate Member), and I have reappointed H. Theodore Cohen, and Catherine Preston Connolly. They will be serving on the Board with continuing members Steven Cohen, Tom Sieniewicz, Hugh Russell, and Ahmed Nur (Associate Member). As City Manager, one of my most important responsibilities is appointing members to the Planning Board. These choices directly impact the future of our community. In our densely populated city, residents want a smart balance between growth, development, and maintaining neighborhood vitality and overall quality of life. The paramount goal of the City administration is for Cambridge to remain a highly desirable community to live, work, or raise a family. I want to thank you for your continuing support and guidance on maintaining this critical goal, and I want to recognize the civically engaged citizens across the City for their dedication, hard work, and contributions throughout this process. Community input has been invaluable to City Staff and me during the selection process and has played a large part in creating a more focused, deliberate, and comprehensive procedure for soliciting and selecting highly qualified candidates. While the process took longer than some may have anticipated, I believe that the selection process has been refined in a way that will continue to benefit us in the future. The City received 24 Planning Board applications from the public. Each applicant was interviewed, and I selected appointees that will best represent the entire community, including residents and businesses. The composition of the new board provides greater balance and representation in terms of neighborhood distribution, diversity of opinion, community perspective and professional background. Please join my staff and me in thanking the out-going members for their incredible level of dedication and service to our community. Cambridge receives great value from citizens who volunteer their time so generously for a better community. These retiring members of the Planning Board are prime examples of the most dedicated citizens who have served us well for many years and I have offered them the opportunity to consider serving on other board or commission in the future. Since the law requires Planning Board members to be appointed for five years, staggering the appointment dates of terms is challenging. Because I am strongly committed to creating a representative board, the City will be recruiting additional Planning Board candidates over the coming months. For the duration of this time, one current full member and one associate member will continue serving on the Board in "holdover" status. While future use of "holdover" appointees should be minimized, I feel it necessary to have appointment flexibility at this time to ensure Board diversity. 1. Be equally considerate, open minded, and fair to all parties with business before them. 2. Follow all City guidelines and be keenly aware of any personal or professional conflicts, both real and potential. 3. Reflect on and consider how projects impact the quality of life in our neighborhoods. During their deliberations and decision making, strongly consider the principles of good urban planning, placemaking, traffic issues, appropriate scale, storm water relief, historical context, and housing needs. 4. Encourage applicants before the Board to proactively engage with neighborhoods and residents, early in the process. 5. Thoroughly review relevant background materials, consult regularly with staff, listen to community concerns, consult with outside consultants, as necessary, utilize site visits, and review relevant reports and studies. Mary T. Flynn is a senior manager and strategic planning leader with broad experience in operations management, community development, and planning and zoning process. She is Manager of Facilities Management at Massachusetts Water Resources Authority. Key areas of expertise include strategic planning, real estate and facilities management, community development and zoning. Early in her career, Ms. Flynn worked as Deputy Director of the Cambridge Community Development Department, and she led the creation of the 1993 growth policy document, Towards a Sustainable Future. Ms. Flynn holds a bachelor’s degree in Government from Cornell University and an MBA from Boston University. She is a lifelong resident of Cambridge. Louis J. Bacci Jr. is a lifelong resident of Cambridge. He lives in the Wellington-Harrington neighborhood in eastern Cambridge and has had the opportunity to witness the changes that have taken place in the City over the past fifty years. Mr. Bacci has served as a Union Representative/Executive Board member of Laborers Local 151 for over thirty years. He has extensive experience in the construction industry and has hands-on experience of day-to-day construction activities and managing and supervising projects. As an Estimator Project Manager and as owner of a property maintenance company, he focuses on creative problem solving and has worked on projects spanning a range of scales and complexity. Thacher Tiffany is an urban planner who holds a masters degree in City Planning with a certificate in Urban Design from MIT. Mr. Tiffany is a LEED Accredited Professional and works in the field of affordable housing. He is Director of Acquisitions for the Beacon Communities, where he manages acquisitions of affordable housing properties through public and private partnerships. Mr. Tiffany also serves on the board of Tent City, a resident controlled mixed-income apartment building in the South End. He has lived in the Boston/Cambridge area for most of his life, and for the last three years in mid-Cambridge. As always, my staff and I look forward to supporting the Planning Board and the important work that they do on behalf of the residents of Cambridge.